It is important to understand how to posture our hearts as songwriters, to give ourselves a safe place to learn and grow in the gifts God has given us. 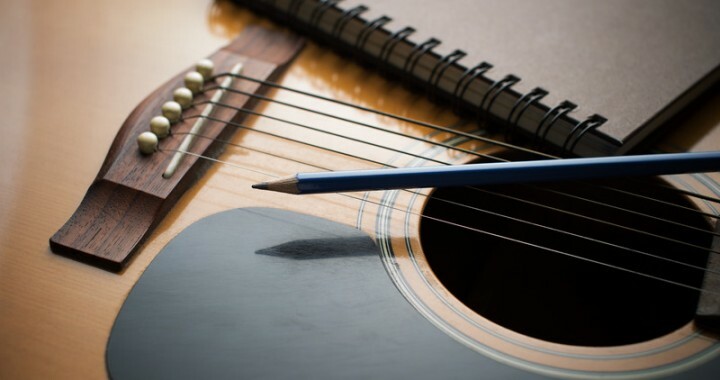 Songwriting is, by nature, a vulnerable process. Taking your beliefs, thoughts, hopes, experiences, and expressing yourself for all to see is not for the faint of heart. When we share our songs, we share a little piece of ourselves – and never know how people are going to respond. Let’s be honest – it’s intimidating! Sometimes we can have our identities to wrapped up in what we create, and can easily feel rejected by another’s opinions. Sometimes we get caught in the comparison game, and start to feel like other people have something that we don’t. Sometimes well-meaning people have told us we had better not quit our day job, and we let go of a dream. Here are three things that have helped me tremendously on my journey as a songwriter. I only wish I had learned them sooner! 1. Focus on the process, not the product. Here’s the thing. You have very little control over what you actually produce, or what other people think. Some days, you will be inspired and music and lyrics will flow. Some days, they won’t. That’s ok. Some days, people will love your music, and some days, they won’t. That’s ok.
What you CAN control is whether you make time and space, invite the Holy Spirit to join you, and put pencil to paper. When you shift your focus from needing a specific outcome (a good song) to simply being willing to show up for the creative process and listen to the Lord, you succeed every single time. You are able to be present for whatever happens during that time. When you move from “how many good songs did I write?” to “how many times did I show up and try?” you will make real progress! 2. Recognize creativity as an act of worship. Human beings are made in the image of God – THE most creative being ever to exist! An artist, a sculptor, a songwriter, painter, you name it…look anywhere in nature and you will see the creativity of God! Our God is truly the Great Creator! Our simple act of creating something is a reflection of His character in us. Our creativity is a gift from him, and using that creativity is our gift back to him. Recognizing God as the creative master that he is and responding by using the creativity he has given us is an act of worship! As we use the gifts that he has given us, we give him glory. And that alone is reason enough to create. 3. Trust that every song has a purpose. Everybody has a song, and every song has a purpose. But sometimes we get focused in on writing that perfect congregational song, and miss some of the deeper purpose in the rest of our music. There are a LOT of different purposes out there, many of which are just as valid but easy to miss. Songs can be for our church congregations. Songs can be for intercession…a prayer that God wants to rest in your heart and come from your lips over and over again. That song keeps the prayer fresh and active in your mind! A song can be a song that encourages and blesses you personally. And last but not least, sometimes songs are simply stepping stones to the next song. No one ever instantly becomes skilled at a craft. Studies have suggested that it actually takes ten thousand hours until you have truly mastered something. Our early songs are often the necessary stepping stones we use to progress further along in our journey…and we should cherish and respect these songs for what they are! 1 John 4:18 says that “perfect love casts out fear.” We are already so deeply loved by our Heavenly Father, who loves to watch his children learn, grow, and create! So take a deep breath, relax, and enjoy the journey! NextWhat is a Weekend UA Songwriting Retreat?